Stepping into San Francisco's Smitten Ice Cream shop is like being simultaneously transported to the past and future. Classics like "Under the Boardwalk" and "Dance with Me" play in the background, while a fog of liquid nitrogen turns the simplest of ingredients into an individual serving of ice cream in about a minute. Customers sit on benches and eat their made-to-order scoops, sundaes or cones, alternating between silent rapture and enthusiastic analysis. On a recent evening, one customer enjoying a vanilla scoop was so effusive in his praise that it cannot be reprinted for a family audience. Robyn Sue Fisher, Smitten’s founder, says that the ice cream gets its smooth texture from her patented mixing technology, which uses liquid nitrogen to instantly freeze the ingredients at the very low temperature of negative 321 degrees. This process does not require traditional stabilizers used in commercial ice cream, and yields much tinier ice crystals than are found in most store-bought ice cream. Fisher also uses local, fresh and seasonal ingredients. Once I tried the store’s four flavors, I could see why her ice cream has such a passionate following. The seasonal rhubarb crisp, made with organic dairy and cooked rhubarb, delivered a tangy punch of flavor without any bitterness. The chunky bits of cinnamon cookie sprinkled throughout made it an even more indulgent dessert. The salted caramel was so buttery that it quickly reminded me of a childhood love for the chewy candies made of delicately burnt sugar. It's clear that Fisher has nurtured a lifelong obsession with this dessert. Fisher started the company in 2007, spent two years developing a patented prototype mixer, began selling batches of ice cream on the street in 2009 and opened the store nearly two years ago. Smitten is not the only ice cream shop to use liquid nitrogen. The chain Sub Zero Ice Cream has more than two-dozen locations around the country. There’s also the Ice-Cream Lab in Beverly Hills, Calif., The Crushery in Denver, and N7 Creamery in Rancho Cucamonga, Calif. These stores are part of an emerging trend, but make up just a sliver of the $6.6 billion spent on frozen desserts at 19,200 shops last year. These sales were a 5 percent increase over 2011 figures, according to the food research and consulting firm Technomic. “We’re seeing a lot of creativity in ice cream in general,” Louise Kramer, communications director for the Specialty Food Association, a trade group, told TODAY. This includes unconventional flavors like avocado, Masala chai and Bourbon burnt sugar. Shops that serve ice cream made with liquid nitrogen, she said, appeal to consumers who like that the concept harkens back to an old-fashioned parlor but with a futuristic twist. Bringing science and technology into the process is a refreshing take on making an artisanal food product. “I feel there’s this little mini-movement happening where food fans are getting a little tired of that handcrafted, plaid shirt, tattoo food culture,” Kramer said. Chef Jansen Chan, director of pastry at the International Culinary Center, said that liquid nitrogen is just another way to “suspend the fat and lusciousness of flavor” into a substance we know and love as ice cream. The technique is used by some restaurants and has become more popular in small shops like Smitten. Fine-dining restaurants that don’t use liquid nitrogen but offer fresh ice cream will spin it every morning so that ice crystals don’t have the chance to accumulate. Chan, who prefers slower-churned ice cream, said it’s up to consumers to decide whether they think the liquid nitrogen technique yields a superior scoop. 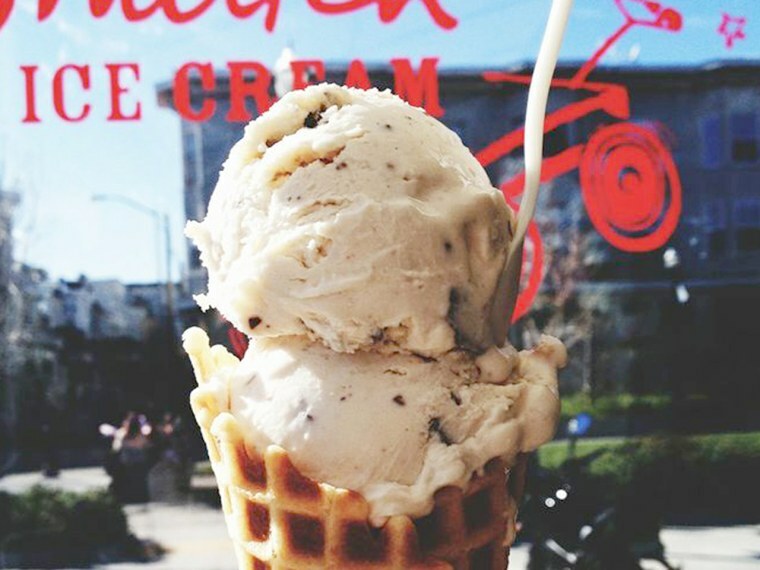 Sherry Hoffman, a Los Angeles resident who recently tried Smitten for the first time, rated her vanilla with toasted walnuts a 7.5 out 10 — not the best ice cream she’d ever had, but one she liked a lot. “I really enjoyed the simplicity of it,” she told TODAY. Chan said he’s hopeful the trend is long lasting, but that it’s difficult to know how loyal consumers will be years from now, especially since an ice cream cone made with liquid nitrogen can be pricier than the offerings at chains like Baskin-Robbins. A small serving at Smitten is $4.75, a waffle cone is $1 and homemade toppings are $.50 to $.75. Chan said some customers are certainly willing to pay more for the showmanship and customization of liquid nitrogen ice cream, both of which provide a huge marketing advantage.